Residents are evacuated by military vehicle after Hurricane Harvey caused heavy flooding in Houston, Texas. 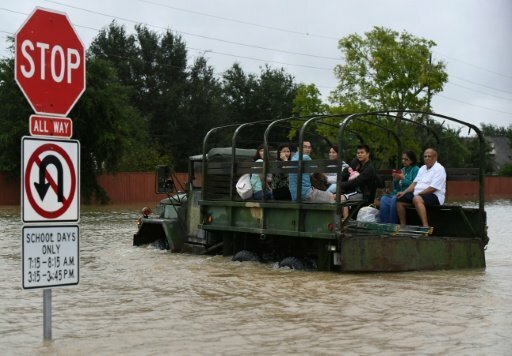 HOUSTON - Authorities in Houston announced the immediate imposition of a nighttime curfew Tuesday as the city tries to head off looting in the wake of epic flooding in Texas. Houston Mayor Sylvester Turner issued an updated curfew time on Twitter from midnight (0500 GMT) until 5:00 am (1000 GMT), starting two hours later than previously announced in order "to allow volunteers and others to do their great work." "We have thousands of people who are out of their homes, in shelters, waiting for water to subside," Turner told a press conference earlier. "Because of the current situation, and the fact that so many people are out of their homes, and power is out, and still it is dangerous to be on the roads late at night, I have decided to impose a curfew starting immediately tonight." The city's police chief Art Acevedo said he had recommended the move to the mayor after several reports of looting in what is America's fourth largest city. "The recommendation was made... because we have had instances of looting," he told the same press conference. "We've had armed robbers that were going around yesterday robbing our community, victimizing them again."